Dr. Ronald Wayne (and Catherine the Great, whose portrait was in Kyra’s family’s possession since the XIXth century, and was “smuggled” by Kyra to America when she left the Soviet Union in 1946). With my youngest granddaughter “Kyra” who insisted I was named after her! My family on a birthday. My youngest granddaughter and namesake, Kyra. Weimaraner Tony, the smartest dog in the world. Little Maxie, a Yorkie whom Kyra saved by giving him CPR. Kyra with her youngest granddaughter and namesake at Halloween with Sweet Pepper. With the Hero of her book, Max. Bijou, was a constant companion and the love of her life. 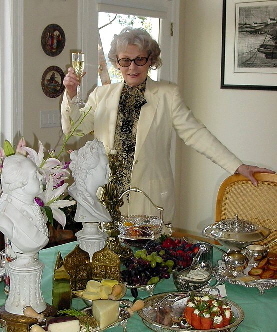 Kyra toasting her family and friends at Russian Easter Celebration (the busts on the table are of Catherine the Great and Peter III.